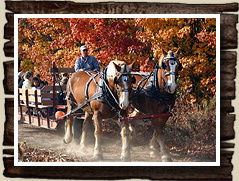 Take a ride through our scenic, West Michigan farm on an old-fashioned horse-drawn hayride. Rides available year-round. 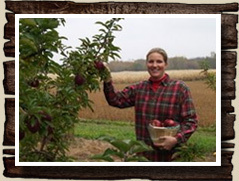 Visit our farm to pick your own apples and pumpkins mid-September through October. We offer numerous varieties and sizes. 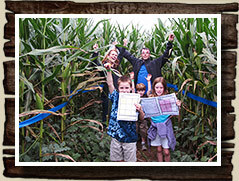 Get lost in the most advanced and challenging corn maze in West Michigan! Fun for all ages during the fall season. Book your next event or group outing! Options available for school field trips, birthday parties, and private events. 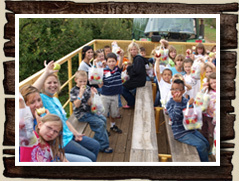 Visit our farm for a variety of old-fashioned farm activities to enjoy with your friends and family. 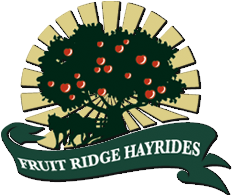 Take a horse-drawn hayride or sleigh ride, find your way through the corn maze, visit our animals, pick pumpkins or apples, and more!